For those who want to sell their houses this spring, they will be disappointed by where home prices are going. According to the S&P/Case-Shiller Index published today, home prices in 20 largest U.S. metro areas have fallen for 9 straight months at the end of March. The current downward trend started last July, shortly after the $6,500 homebuyer tax credit expired. The government incentive, which originally took effective in 2009 when the American Recovery and Reinvestment Act of 2009 became law, helped end home prices’ 26 consecutive monthly decline from April 2007 to June 2009. But, while the tax credit boosted home sales for a few months, it’s now quite clear that the tax credit can only do so much. There’s no fundamental change in the housing market even as the economy slowly recovers from the worst recession in decades. Last week, Realty Trac, the leading online marketplace for foreclosure properties, issued its latest foreclosure sales report, and in the report, Realty Trac noted that about 28% of all U.S. residential home sales in the first quarter of 2011 were houses owned by banks. That’s the highest percentage in a year. With some many foreclosed homes on the market, sale prices were pushed down hard. According to Realty Trac, in the first quarter, average price of foreclosed houses was nearly 27% below the average sales price of properties in normal sale. With more than 1.9 million homes already taken back by banks, Realty Trac says it will take about three years just to clear up this huge inventory. 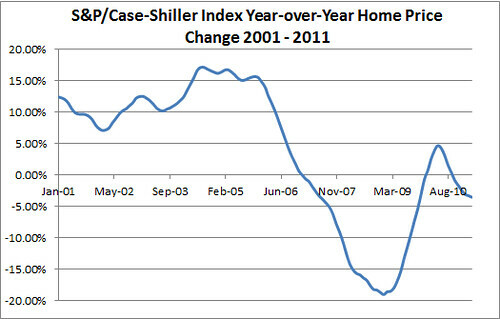 Until then, don’t expect home prices to show any significant improvement. And many economists have said that the economy won’t truly recover until the housing market recovers. The S&P/Case-Shiller Composite-20 Index covers 20 metropolitan areas. The plot above shows year-over-year change of the Composite-20 Index from 2001 to March 2011. Among 20 cities traced by the Index, only Washington DC shows a year-over-year prices increase. Minneapolis has the largest one-year price decline of 10%.